Folding Cup Holders. Great for car, boat, truck or RV. Easily mounted with screws, and can be mounted anywhere there is a flat vertical surface. Adjustable arms hold cups up to 46 ounces. Made in USA. Usually ships by next business day. Please allow 1-5 business days for delivery to most US locations. Express shipping available. While sitting in the made up bed in our Roadtrek Class B van and watching TV there was no place to put your drinks without one of them tipping over,so I installed four Cup Holders in different locations. They fold up almost flat and do not interfere with anything when you are not using them and there has not been a spilled drink since. I was bummed. The quality is good but the overall size is slightly too big to be used as an OEM cup holder replacement in the square openings in the back of my '02 Eurovan MV. EuroCampers reply: Yes they do not fit the wall panels in the EuroVan MV. Our product description says this. 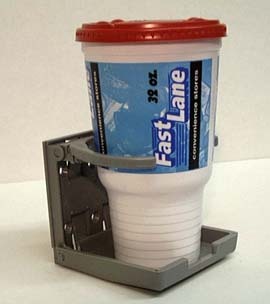 They can be used in other places to add a cupholder and will replace the original in the EuroVan Camper by Winnebago. For EuroVan MV, see part number 46219, these are an exact fit. I bought these folding cups for my two door van and they look great installed. However, when you shut the door next to the one where the cup holder is installed, the cup holder will not hold and throws the filled cup out. Very dissapointed. These cup holders filled a void in the back of my RV. I make coffee in the morning, and then we sit in the bed and enjoy the coffee. But my RV had no place to put cups, so I bought two of these and installed them in the back. Now I have the cup holders that we didn't get with our RV. These are solid cup holders. They should hold-up well.